Art stuff thread starting...NOW! If you draw stuff, you can post it here! I draw in a sort of anime/manga/toon style, but if you don't, don't let that stop you from posting your stuff! I would love to see other people's art so post away! They can be OCs, fan art, or just random stuff. You can use any media, including digital, like I do! Just to let you chatterboxers know, I started this thread so we can share our tricks of the trade with each other. Feel free to: ask questions about how to draw certain things, post techniques, share art, and mostly HAVE FUN! If you draw your OCs, feel free to share information about them such as their names and that sort of thing. Same goes for fan art since not all of us know where these characters are from. You don't have to be polished with your art. I myself am just a beginner at anime/manga/toon. I'm not good at hands so if any of my hands looks particularly cruddy, you know why. I also struggle sometimes with feet so same goes for that. If any of you know how to draw a particularly good hand or foot, feel free to share your trick for it. Going to post a picture of my OC, Tuxedo, if this post goes through okay. Here's an egg hatching that I drew!!! Except it looks a little weird. I apologize for the vintage-y look of it. I can take another picture if this one doesn't turn out very well. I worked really hard on it. Tell me if you like it! I like it! Much better than anything I could do. OOOOH MY GOOOSH YOU ARE SOOOOO GOOOD, MICEARENICE!!!! I'm so hyped this actually got a reply, so thanks for that, too. Imma going to post a picture right now! Say "Hi" to my OC, Tuxedo, that I promised to post. OH AND I LOVE THE VINTAGE LOOK; SOOO COOOOOOOOL! XD I love the shading. It doesn't look weird at all, by the way. Wow, that's good too! I'm sorry if this comes across as rude, but is it hand-drawn? That is AMAZING! I am so jealous! 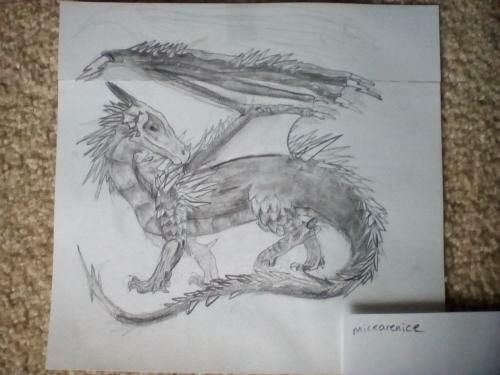 I love dragons and think I'm pretty good at drawig them, but this is wonderful!Did you use charcoal? THX, Katydid. And I did not draw this with charcoal, I used an ipad. Wait, was this response for me or for Micearenice's dragon? If it was for me, then thanks for the comment. This is my first time posting my art, so I'm really hyped that this became a thread. Lap out. Here's some wolves I drew. Just a sketch, nowhere near as good as Mice's dragon. At least, I think this is the right file. I'm not sure. Those wolves are great, Scylla! (Sorry this reply is so late.) I love the way they look like they're moving. I can't draw wolves that good, but you are so good! I saw you posted a picture of a dragon like creature on another thread, and that was amazing! By the way, my OC Tuxedo actually was drawn on my mom's ipad. I used a drawing app kown as Pro Create, and I highly reccomend it if you tire of using pencils to color your pictures. The layers make drawing a bazillion times easier because you can erase the guidlines/gesture drawing more easily, and it also has flood fill. (If your tablet isn't an ipad, I suggest you download Sketchbook Autodesk instead. It pretty much works the same but with fewer layers to work with, unless you subscribe to Sketchbook Pro, which I don't.) Oh, and a note: If you are going to draw on a tablet, I recommend you use a stylus. :) I'll see if I can upload my fan art of Petra from Story Mode. I'm probably the only one here who plays that video game, but I'm very proud of my fan art. It's actually drawn with pencil and scanned with an ipad. I'll upload that soon. :D Lap out. Thanks, I'm glad you guys like it! I think Tuxedo is great, Lap R! I've always wanted to be able to draw cartoon-y style stuff, like manga, but I've never been that good at it. I love your drawings! I'll have to show you all of my dragon drawings! 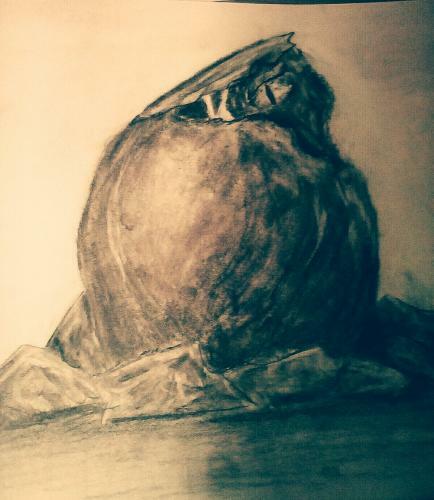 I'm trying too get more into charcoal as well. Soon I am going to start a dragon notebook, with all sorts of dragoon stuffs. Ooooh, yes! I'm doing a dragon notebook, too!!! This is so exciting!!! I drew the dragons, and so far I've only done two, but I should add the dragons I shaded that are already hanging on my wall!!! (Sorry, I'm excited, if you couldn't tell). I can't seem to find a good material to use for a 'membrane sample'. I was going to use a white latex glove and color it, but we only have blue gloves. I'll show you some of my colored dragons soon! Glad you like my Tuxedo picture. She took a lot of effort to draw, so thanks! Oh, and your dragon is epicly cool! The shading is so explosive, too. My cousin likes drawing dragons, so I'll make sure to show him this! Hopefully, he'll be joining us at CB sometime in the near future. I think he'll love the tail spikes as much as I do! :D I'll post more art here later! Micearenice, that is TOTALLY amazing! You are so good at drawing! I'm jealous. I can NOT draw anywhere near that good! I love drawing dragons too!! That's literally all I ever draw. I feel like I'm pretty good, but I'm not so sure I want my drawings all over the Chatterbox. I love seeing everyone else's though! Great job, and keep posting! PS My captcha (i hope i spelled that right), Starfire Scales, says 'nckx'. Necks? Is she a vampire? Or is she insulting my (I'll admit it) overly long neck? PPS Starseeker is the name of a black and purple dragon I created. So... dragon insane!! !